Looking east on Water Avenue at Hill: For traffic, it’s going to be a tight fit. On Water Avenue, nearly half the street’s width has disappeared so that crossing gates can be installed at this gateway to the Edgewater Village development. Albany drivers may wonder if this is wise. In 2008, the city of Albany commissioned a “streetscape” plan for Water Avenue. 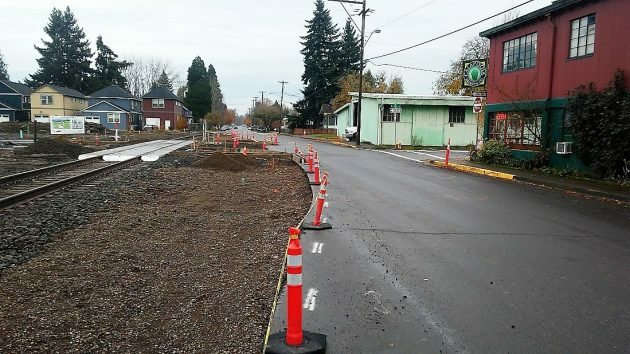 One goal was to allow development of properties north of the old Oregon Electric rail line along the street. Thus the plan tried to provide space for crossing gates that were required by the Rail Division of the Oregon Department of Transportation. Water Avenue at Hill Street was 35 feet wide between curbs. The crossing construction has taken up about 15 feet (according to me pacing it off). This was not what planners had in mind in 2008. The plan shows the drawing of a typical intersection improvement at crossings where gates are needed. But the drawing has both travel lanes shifted away from the tracks, as was done a few years ago on Water Avenue at Jackson Street, where there was room. But the same solution is impossible at Hill, because it would demolish the Calapooia Brewing Co. and the warehouse on the east side of Hill. 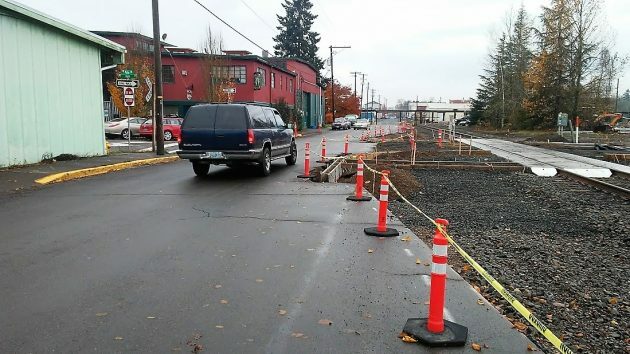 Another twist: Water Avenue will get stop signs at Hill, again because ODOT-Rail says so, just like at Jackson Street, the entrance to the Wheelhouse office building. The state agency doesn’t want vehicles stopped on the tracks when a train is coming. So the heavier traffic on Water is being stopped instead. Looking the other way, west, at the Water/Hill intersection. Where is all the money coming from for the many various “streetscape” projects that are now in the works in Albany? Did the Albany voters approve a bond for it or is it “free” money from somewhere else? Way over built, far too over regulated, beyond any reasonable level of need regarding Water St crossings. When pray tell was the last collision between a vehicle & a train on Water St??!! I’m reminded of a line from a long ago movie & that is..”What we have here is a failure to communicate…! !” Like what is really needed & practical & what the ODOT/Train people say we need. My gawd, if you as a driver can’t see a lumbering train coming at you at the regulated 7mph (I believe) then YOU need to give up your license!! Perhaps there might be publicly-underwritten urban renewal dollars in search of a solution to this traffic conundrum. If the monies could be found, it might be feasible to elevate the track from the Downtown Urban Core, maintaining said elevated track until any trains using this spurious spur will no longer be so troubling for those operating motor vehicles. The potential for hipster businesses populating the newly-minted space below the elevated track, along with the generous tax revenues said entrepreneurs will provide is tempting, indeed. While not inexpensive, there must be some manner of City Consortium with borrowing and bonding authority which would be willing to advance the noble cause. Besides, narrowing a street as it passes a saloon is downright dangerous. Just another example of conflicting government over-regulation. We don’t have to be happy about it, but we should not be surprised. Even though I don’t agree with the reasoning for this, this may not be a horrible place or way to slow down traffic a little. Especially once there are more residences there. I do like the efforts of improving this part of town, making Water St more useful, but this crossing at this location is not smart. Parking lot for Calapooia Brewing like it has for overflow, yes, but entrance/exit for the housing? Other safer options are there. Does this housing section have HOA fees to pay for the crossing? The railroad runs our lives in Albany and where are the benefits for us? Where is the common-sense leadership? Is there a schedule for when cars & “engine” travel these rails? Be FUN to watch the line roll by while drinking a jalapeño pepper brew & hanging out across the way from what will possibly be a Pike Place Market inspired place of consumerism. No schedule? Off to the downtown museum for answers I suppose. Wow, that great big crossing guard to protect people going into that new neighborhood of very expensive homes then just past that the tracks Run right down the center of the street with no warning signals at all. Brilliant planning.